After the winter we’ve had – not just in Fethiye but throughout the whole of Turkey – this year, any sign of warm spring sunshine and we’re out there, relishing in that lovely feeling of pleasant heat on your back. April started off full of promise. And then, from nowhere, the last throes of winter fought back to blanket the country under a cold front that saw the summit of Babadağ disappear from view and the tables of Zirve Cafe covered in a good inch or so of snow. So that’s what we did. No big adventurous day out or anything – but, when you’ve not been there for a while (October was the last time we ventured down here), it’s a day out to look forward to. A day out to look forward to when you know it’s not too hot for wandering, you know the spring wildflowers are in full bloom…and you know Belcekiz Beach is going to be in full-posing splendour; a vast sweep of sand and shingle with a smattering of sunbathers and a sea so blue, those not in the know would accuse photographers of over-editing the image. It’s still a ‘wow’ feeling to see it, no matter how often we visit. But here’s the different part. This is very interesting, at least for us. We also decided to have a wander along to the beaches around the back end of the lagoon. We always say to ourselves that, apart from when we hike from Kayaköy to Ölüdeniz, we’ve not been down to this area for ages. Well, ‘ages’ is the lifetime of this blog. Just wow! This blog is 5 and a half years old and this is our first ever post that really features the lagoon. Of course, it’s listed as one of the reasons in our 11 Reasons To Visit Ölüdeniz post…it’s just that we’ve not followed our own advice. No real time spent at this end of the beach in almost six years. What’s that all about, then? And Friday was perfect for reintroducing ourselves to the area. To stroll, to take photos and to just breathe in the views with hardly any other people around. In a week or two, this area will be up and running but, on Friday, most of the gates to the beaches were still locked; a few people were on one of the beaches that was open; in the distance, we could make out people on kumburnu (that world famous stretch of sand that reaches out to break the waves of the Mediterranean and form the lagoon) and, well, it was lovely to wander; especially with so many spring wildflowers around. We’ll not pretend to know what any of them are – we just enjoy their presence. In years gone by, the stretch along the back side of the lagoon was just that; a stretch. A beach where not many people ventured to. As time went on, Hotel Meri was built and then, even later still, private beaches started to develop. Today, in 2015, you can choose from a host of beaches, all offering sun loungers, umbrellas, food, drink and accommodation of various types. It’s a thriving area around here…but, in springtime, out of season, it’s for the wildflowers, the fish and the aimless amblers. I mention fish because the water at Ölüdeniz lagoon is so clear at this time of year and you can see the fish flitting around, doing their thing, minding their own business. We went right to the shoreline in a tiny area that remains unclaimed by any of the businesses along here and a young Turkish couple were there, too. The girl was removing her shoes to go for a paddle while the guy talked down his phone at horse racing commentator speed. As she ventured in to ankle deep, he paused his conversation to ask if the water was warm. “There’s fish,” was the reply. Anyway, our sunny stroll to the beaches of the lagoon has confirmed that we really must get ourselves back here once the season has started. We get so caught up with meeting friends around Belcekiz Beach that the years really have flown by and it’s easy to forget how paradise-like it is around this area. 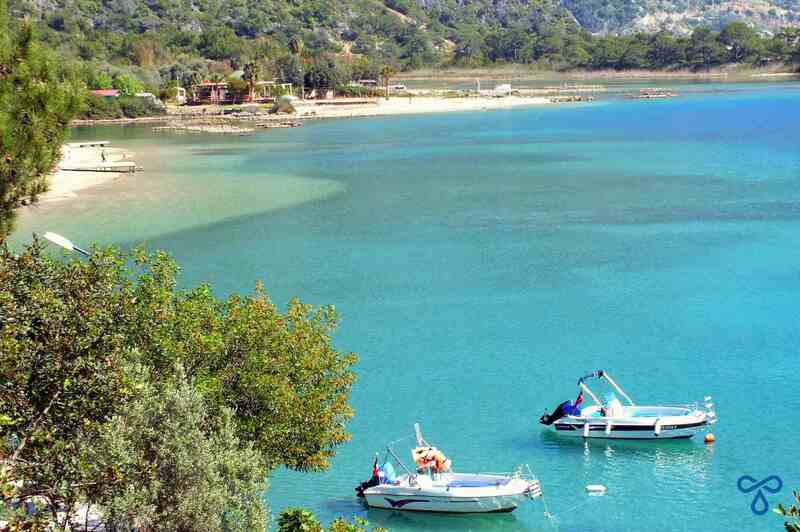 Our friends at Denizatı Restaurant in Fethiye own Sea Horse Beach; a beach we always went to before we kind of forgot about the lagoon. They’re always saying to us we should go down…and we always say yeah we’ll go down…and we never do. But this season, we will. . . can’t beat these places out of season – who’d be anywhere else this time of year? It’s perfect isn’t it Alan. And we love it when the Fethiye area is packed with people enjoying their holidays…it’s just nice to see everywhere as it is when it’s so peaceful, as it was before tourism hit the area. I can feel the warm sun you are feeling on my back too. Where we live in Australia it is always warm but when we visit a Country where it does get cold it is wonderful to feel warm in the sun again in Spring. We are in Europe at the moment. We arrived in Rome and just spent 4 days in the lovely Spring sunshine. I wish we could pop over and look at your lagoon. It is amazing how time flies isn’t it! 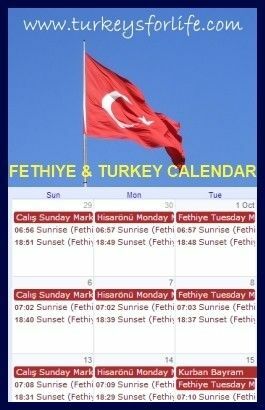 My friend and I are going to Fethiye the 1st 10 days in June anyone got any ‘must see’ places to visit by dolmus or within easy walking distance please? We have been to Akbuk for the past 4 years so know that area fairly well.